Benefits of Drinking Milk And Other Lies We've Been Told. Cow’s milk is nature’s perfect food… if you are a calf but obviously you are not. Your body does not need milk or dairy products. If you are like me, you probably grew up drinking milk often. I was encouraged to drink milk if I wanted to grow taller and stronger. You remember all of those commercials with gorgeous models, celebrities and even Dr. Phil with their milk moustaches telling us “milk does a body good.” This was all based from one research study and guess who funded the study? The Dairy Industry. Cow’s milk is meant for its babies. Humans are the only species who drink the milk of other species. Think about how much weight a baby calf puts on just from its mother’s milk alone. A calf will increase its weight by eight times before it is weaned. Cow’s milk is full of natural hormones. These hormones are intended for a cow that is producing milk for its baby. (Do you think you need these hormones? What do you think these hormones will do to your body?) The cow is also given steroids to fatten it up and other hormones called rBGH to keep the cow lactating. Even if you see a milk carton that says “no antibiotics” it just means that no additional antibiotics were put into the milk, but they were definitely administered to the cow. Countries with the lowest rates of osteoporosis have the lowest dairy and calcium consumption. Drinking milk and eating dairy products will make your body produce more insulin-like growth factor-1 or 1GF-1, a cancer promoter. You body stopped producing large amounts of lactase, the enzyme needed to metabolize lactose, when you were between the ages of two and five. Lactose is the sugar that is in milk. Milk contains about 300 mg of calcium per cup. Drinking milk acidifies the body pH. Calcium is an acid neutralizer. Your body will neutralize the acidity in your body by using calcium from your bones. Drinking milk causes calcium loss. So if you want strong bones, do not drink or eat dairy products. Dairy products have been linked to allergies, arthritis, respiratory problems, diabetes, obesity, high cholesterol, heart disease,prostate cancer, testicular cancer, and possibly breast and ovarian cancers. 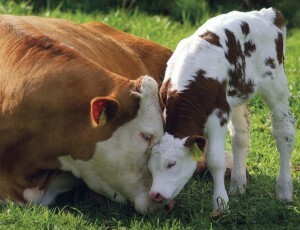 The treatment of dairy cows is inhumane.The mother cow and her baby are separated at birth. Cries are so loud for each other, they can be heard from far distances. Then the mother is chained to a small stall where she is there for the rest of her life until she is slaughtered. She never sees green pastures, she is never free to roam. She is tortured for her entire existence. If you watch some of the videos available online you can see for yourself what goes on. Do you want to support that by continuing to buy milk and dairy products? What about all the claims that consuming dairy products actually helps you lose weight? There is no way that dairy can help you lose weight. Skim milk and dairy products made with skim milk are over 50% sugar, as a percentage of calories. There have been thousands of research studies conducted on dairy and only one researcher claims that it helps with weight loss. He is funded by the dairy industry. So as you can see, there are not any benefits of drinking milk as we were taught to believe. I invite you to take go dairy free for ten days and see how you feel. Maybe after ten days you will eliminate it from your diet permanently. There are some excellent substitutes for dairy products. I recommend hemp milk as an alternative for milk. I do not recommend soy milk. Also, be sure to look out for anything that contains carrageenan. It is a known carcinogen that is added to many organic dairy substitute products. By giving up dairy, you will feel better, I promise! Your body will feel lighter, you will have more energy, your cholesterol will lower, you will reduce your risk of cancer and other dairy related problems and you will be healthier.